I’m sure nearly everybody knows about this, but today’s tip is just a nudge to actually do it: if you have sites that you regularly visit – Facebook, email, the news, an online calendar, Amazon, favourite shops, etc. don’t waste time looking them up in your ‘favourites’. Next time you’re at one of those sites, just drag the address into the links bar of your browser. Get rid of all the crap ones that were pre-loaded there first, so you’ve got room. Delete unwanted links from the links bar (or bookmarks bar as it’s called in Chrome) by CTRL-click (Mac) or right click (PC) and selecting ‘delete’ for each unwanted link. This makes space for your own links. With the mouse, grab hold of the ‘favicon’ (the small image immediately left of the address) and drag it down to an empty space on the links bar. The cursor will turn to a + sign when you’re correctly positioned. Note: if you can’t see the links bar, it’s probably because you’ve opted to remove it from view – so go to the ‘View’ menu and make sure that the links/bookmarks bar is ticked. If you have links to several pages on the same site, you can create a folder on the toolbar and drop all the links to those pages into that folder. If your links bar starts running off the right hand side of the screen, delete some links. There’s no point in a links bar where you can’t see the links. This entry was posted in Advent calendar and tagged IT, IT tips, advent 2011, browsers, drag and drop, links, links bar on December 21, 2011 9:50 am by Jonathan Still. For posterity, my original advice is below. The bit that was crucially missing from my advice was that you mustn’t import documents below the dividing line in the sidebar. For selected pages only: Open the files that contain the pages that you want to include in the compiled file (Ensure that View Sidebar and Thumbnails is selected in the View>Sidebar menu in these files too).Arrange the windows on the screen so that your destination file (the one you’re going to drop all the others into) and the source file (the one containing the pages you want to drop in) are both visible.In the source file, select the thumbnails of the page(s) that you want to add, and simply drag and drop them into the sidebar of the destination file. 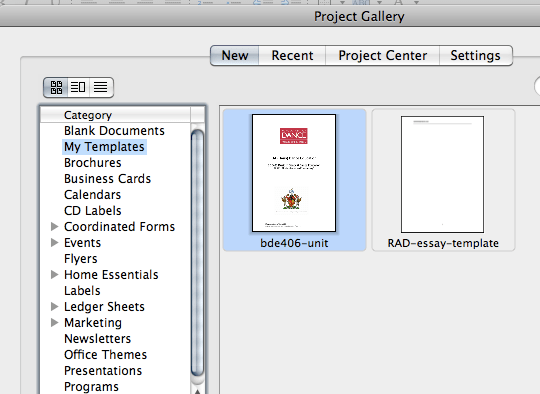 In the destination file, you can drag files up and down the sidebar to reorder them, or delete individual pages. 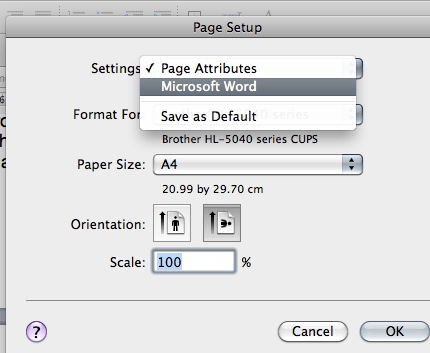 It’s a good idea to make a blank page in Word or other program and print that to pdf so that you’ve got a blank page handy to insert where necessary – for example, you may eventually want to print this file double-sided, and if the first two pages are a double-page spread, you’ll need a blank page to start with. This is particularly relevant for music books. As you can put image files into a pdf, this is also quick and dirty way to make a presentation without PowerPoint – just drop the relevant pictures and pages you need into a pdf, and wiggle them around. 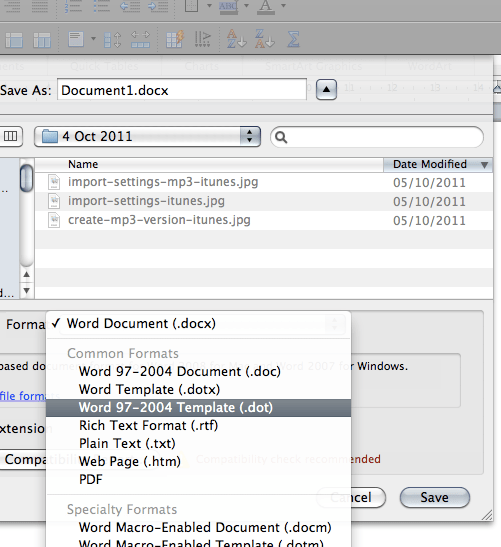 You can use Preview or Acrobat to show the presentation, too. I discovered this tip by accident – as far as I can see, there’s nothing in the menus that seems to offer you this fantastic option. 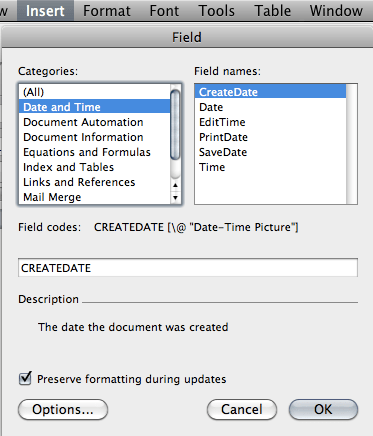 This entry was posted in Advent calendar and tagged IT, IT tips, Mac, PDF, advent 2011, pdf hacks, presentation, preview on December 20, 2011 11:59 pm by Jonathan Still. I don’t mind admitting that I am so easily distracted by stuff on the Internet, that if I didn’t have a program like Freedom (Windows & Mac), I probably wouldn’t get much done at all. Freedom is a very simple utility that allows you to block your internet access for an amount of time in minutes. During this time, you won’t be able to access anything online, thus forcing you to do whatever it was that you were supposed to be doing (writing an essay, sending an invoice, tidying your room). It costs $10, but there’s a trial version which allows you to try it five times for free. One of the unexpected benefits of getting this software has been that I now have a much better idea of which kind of job I am likely to procrastinate on or avoid, and on days when I know I have something like that to do, I switch Freedom on for 90 minutes as soon as I turn the computer on. This entry was posted in Advent calendar and tagged IT, IT tips, advent 2011, network blocker, procrastination on December 19, 2011 6:42 am by Jonathan Still. If you do things like record lectures or interviews on your mobile, laptop or portable voice recorder, or want to transcribe speech from a video, what are you going to do? Press play with your hands, listen a bit, press pause with your hands, type a bit with your hands, stop, press rewind with your hands, press play again with your hands…and repeat til insane. You get the point: you need two pairs of hands if this is going to go anything but dead slowly. But with a USB foot control (like the Infinity) and some free software called Express Scribe you can sail through this kind of job. For example, you can easily set Express Scribe to automatically go back, let’s say, one second when you release the ‘play’ pedal with your foot. That means you don’t in fact have to use the rewind button at all if you’re on a roll. It is so much faster than any other method involving your hands alone, I would be lost without it for any transcribing job. And it’s not just speech that it’s good for – if you’re a musician trying to work out the chord sequence or melody to a song, it’s perfect for transcribing music from audio files where you have to listen several times over to the same little bit. Your hands never need to leave the page or keyboard that you’re working with. This entry was posted in Advent calendar and tagged Express Scribe, IT, IT tips, USB foot control, USB footpedal, advent 2011, transcribing, transcription software on December 18, 2011 9:21 pm by Jonathan Still. Let’s say you want to send someone a YouTube clip or embed it in a post, but the bit that you want them to see is right in the middle of the clip. Wouldn’t it be nice if you could just link straight to that part of the clip? Well you can. All you have to do is this. 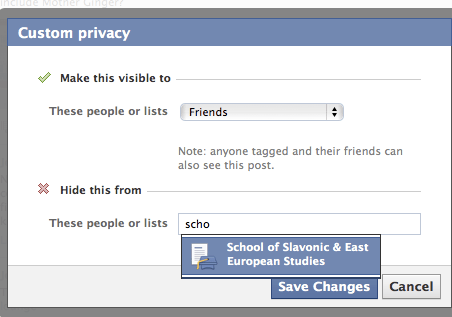 There are two different processes here: sharing a link on something like Facebook, and embedding in a webpage. Both processes are shown below. 1. Find the place in the video where you want it to start, and pause the video there. 3. The time in the box will be automatically updated from wherever you paused the video – that’s why you have to pause it, because otherwise the time in the box keeps changing as the video plays. 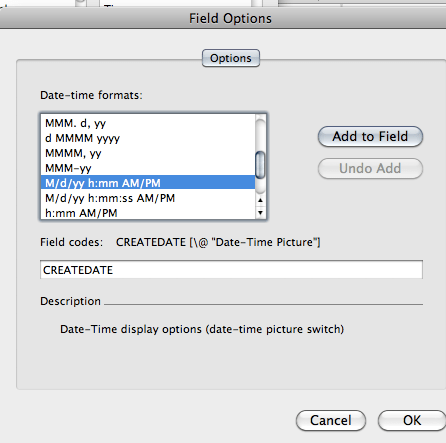 You can manually type in the time, maybe adding or subtracting a second or two if you didn’t quite pause it in the right place. 4. Copy the code and paste it into your Facebook post. 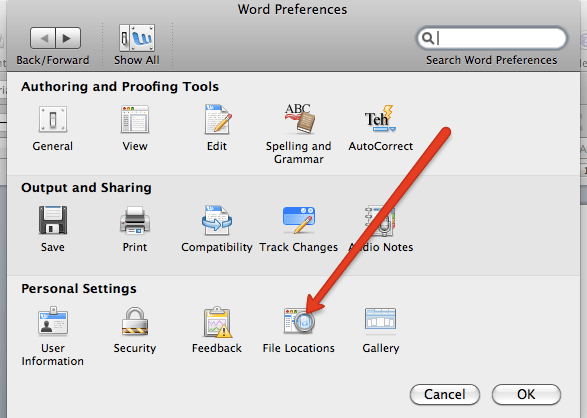 Be sure to make a space and press return after the link – this seems to be necessary to cause the video to be embedded. 2. Note the time that you want the video to start. 6. In the embed code, right before the final double quotation marks after the link, add ?start= and then the number of seconds, e.g. ?start=156 if you want it to start at 2’36”. 7. Paste this into the place where you want the video to appear in your page. 8. Turn “visual” mode back on (just because it’s easier). A greyed-out screen will appear where your embedded video will be (it will only show up when you preview the page, or publish it). I’ve revised the information above on January 9th 2015 because the previous method (see below) seems now to be obsolete – but leaving it, in case the legacy method is useful for any reason. I’m borrowing the method from this external post, but simplifying and slightly amending it to fit the way it looks on my screen. 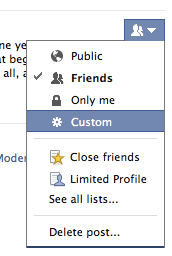 Another way to do this is to press ‘Share’ then select ‘Options’, then tick the check box next to ‘Start at’. This entry was posted in Advent calendar and tagged Facebook video, IT, IT tips, Youtube, advent 2011, embedding, links, time points, video on December 17, 2011 12:23 am by Jonathan Still. 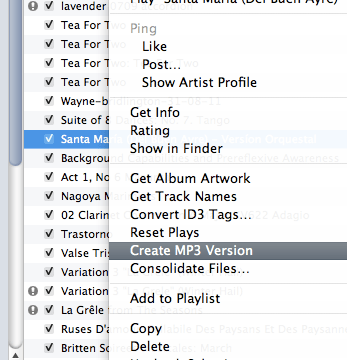 If all you want to do with your music is play it on your computer or phone, the iTunes default setting which imports music files as AAC (Advanced Audio Coding) is fine. It’s the the standard format for Apple products and several others, and is supposed to be better in quality than MP3. But life gets more difficult if you want to do anything else with it – like edit it in Audacity, for example, or send it to someone who hasn’t got a device that can play AAC files, or transfer it to one of your own devices that doesn’t like AAC. In this case, you’re better off using MP3. You might just want to convert a single song to MP3 for a particular task, while keeping the rest of your library as AAC. Here’s how you can do it for free in iTunes – no need to pay money for ‘format converters’. It’s the same procedure that you’re offered when you first put a CD into iTunes – there’s a button in the bottom RH corner of the screen called ‘Import settings’. 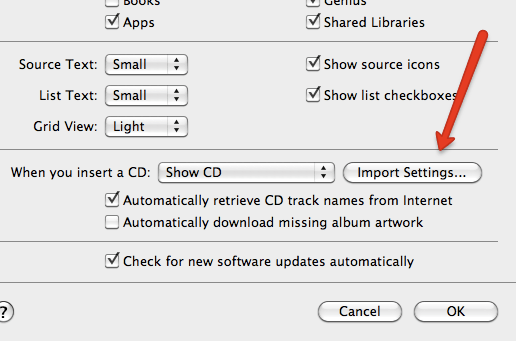 The point about this tip is to show you how to apply the procedure retrospectively, even after you’ve already imported the CD. 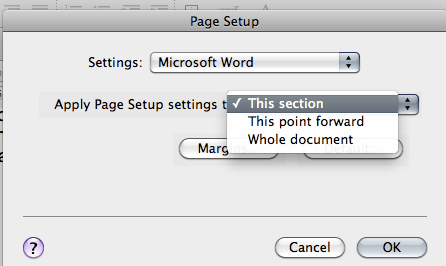 The instructions below are for a Mac, but the principle would be the same on a PC. 3. 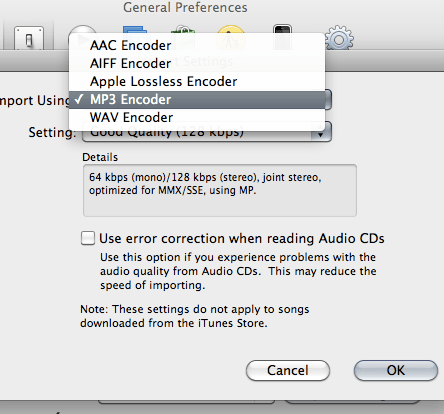 From the menu that appears, select MP3 Encoder (obviously, if that’s already selected, you don’t need to do anything!). The other settings don’t so much matter, though ‘Good quality 128kbps’ is quite enough for most purposes. 5. In your library, a new track will appear with exactly the same name as the original, but with a newer date in the ‘date added‘ column – so if you can’t find it, sort this column to bring it to the top or bottom of the list. It’s a good idea to rename this track putting ‘Mp3 version’ in the title, so that it’s clear which track is which. 6. 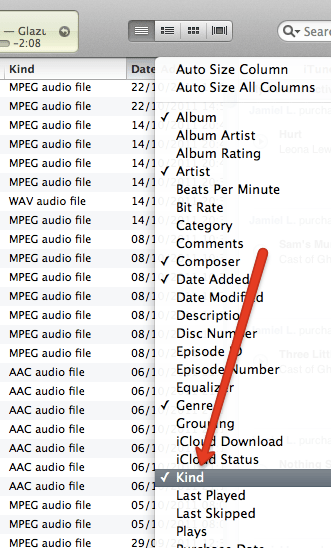 In the folder where your iTunes library is kept, there will now be two versions of the file, one in the original AAC format, the other (newer) one in MP3. If you want to retain your library in AAC format, remember to switch back the preferences after you’ve finished this task. 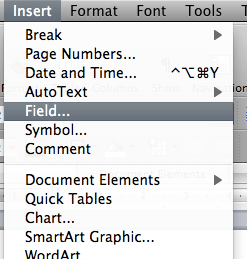 iTunes removed this capability from one version of the program, but it’s come back again in the latest version. I can’t guarantee that they won’t remove it again – it’s just too good to be true, frankly. Converting to MP3 or AAC results in a certain loss of quality, so choosing to convert AAC or MP3 back to WAV or AIFF is not going to improve the quality – it would just be like putting Cadbury’s chocolate in a Charbonnel et Walker box. However, if you know that you are eventually going to use the track for a show, where the highest possible quality is desirable, remember to import the CD as WAV or AIFF in the first place, or get the CD and re-import it as WAV/AIFF. If you’re the kind of person who has a library full of things called ‘Track 1’, it’s a good idea to name the track you’re going to convert to MP3 first, so that it’s easy to find the new track in your library. If you’re not sure which track is which, CTRL-click on any of the columns in the browser to add more columns, and select ‘Kind’ so that you can see what format the file is in. This entry was posted in Advent calendar and tagged AAC to MP3, Audacity, IT, IT tips, MP3 converter, advent 2011, audio formats, iTunes on December 16, 2011 10:27 am by Jonathan Still.